Freckles. These are small brown, flat lesions. They are more common in youth lightening with age. They are more common in skin types 1, 2 and 3. Causative factors are genetics and sun exposure. Solar Lentigines. These are 1-2 cm in diameter. They are brown flat lesions which are caused by chronic sun exposure. Melasma (chloasma). This is a brown flat pigmentation occurring in a symmetrical fashion on the face. It is common in women in pregnancy and with use of the oral contraceptive pill. It is exacerbated by sun exposure. It is the most difficult type of pigmentation to treat and sometimes a combination of creams, peels and laser may be required for optimal results. Birthmarks. IPL is not suitable for all birthmarks, these would need to be assessed by the doctor prior to treatment and she will advise the patient/parents on the best treatment options. Rosacea/Red Veins. IPL is the treatment of choice for rosacea. However sometimes rosacea will require other treatments like antibiotics oral and topical. 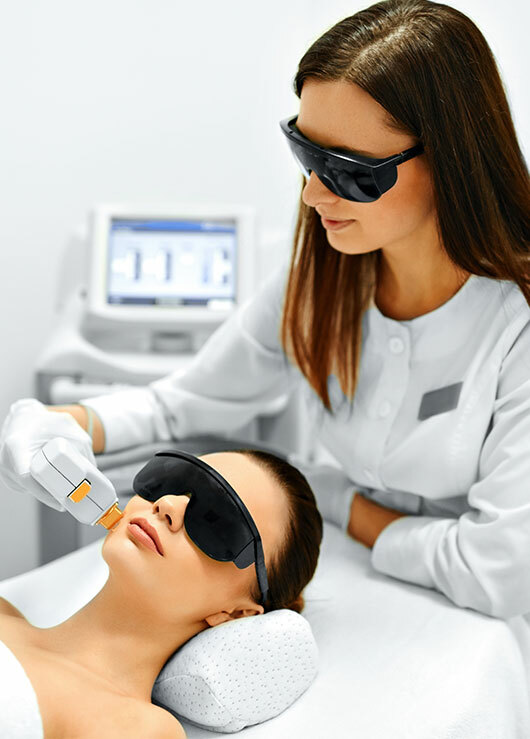 A Dermatology consultation with the doctor would be required before laser treatment. Red veins also respond very well to IPL treatment however some larger veins will respond better to a vascular laser or dermarolling. Again an assessment with the doctor is important before starting treatment. Any raised lesion;. It is very important before starting any form of laser/IPL treatment that a medical doctor has a look at any suspicious lesions. If they are suspicious they will need to be biopsied where a small piece of tissue is sent to the histology department in the hospital for analysis. Any raised lesions should be covered with white sticky paper to avoid treating. Moles, Basal Cell Carcinomas, Squamous Cell Carcinomas, melanomas, Seborrhaeic keratosis should absolutely never be treated with a laser/IPL machine. These are best removed surgically or treated appropriately. Your doctor will discuss best treatment with you. Tattoo. An IPL laser is not suitable for tattoo treatment. An IPL works by selective thermolysis of melanosomes. The melanin within the pigmented lesion absorbs the light energy. Heat destroys the melanin containing keratinocytes and potentially the melanosomes within the mealnocytes. After IPL (1 minute to 48 hours later), the melanin undergoes a chemical change and turns darker. The cell that contains this darker melanin travel towards the stratum corneum and then slough off. This takes about 5-7 days on the face and 14-21 days on other areas. On average most patients need between 3 and 6 sessions and results need to be maintained with sun protection and sunscreen, melanin inhibiting cosmeceuticals. And maintenance sessions. Skin may repigment anyway because of the genetic make up so sun avoidance as much as possible is recommended. Treatment intervals: FACE= 2 to 4 weeks. BODY= 3 to 6 weeks. IPL is NOT suitable for treatment of: vascular birthmarks, Varicose veins, Keloid or Hypertrophic scars. These are small multiple, dilated vessels. Some vessels are distinct but others are very small appearing as general facial flushing. These are common on the nose, cheeks, chin forehead, chest and legs. Causative factors include genetics, sun exposure, smoking and extreme temperatures. Upper body vessels respond better to IPL. This has a vascular and inflammatory component. Patients have papules, pustules, erythema, telangiectasia and facial flushing. Rosacea occurs mainly on the cheeks, nose, chin and forehead. It has a greater incidence in skin types 1 and 2 “the disease of the Celts”. The cause is unknown but it responds very well to antibiotics, skin care products and IPL /laser. This is a combination of mottled pigmentation and a variable degree of telangiectasia that mainly occurs on the upper chest in a v-shaped fashion and sides of the neck. It is caused by epidermal and dermal thinning. Causative factors include hormonal, sun exposure and smoking. It responds very well to IPL (Intense Pulsed Light) therapy. How does IPL treat vascular lesions? Red blood cells contain haemoglobin molecules. A Haemoglobin molecule contains heme, an iron pigment complex. This enables the red blood cell to hold oxygen creating Oxyhaemoglobin. Oxyhaemoglobin is bright red. The heat destroys the red blood cells and the endothelial cells (cells that form the blood vessels) This can result in permanent destruction, part destruction or temporary destruction of vessels. The effectiveness is determined by vessel size and depth, the fluence used and the pulse width of the IPL. In order to maintain results a maintenance programme is recommended. Treated vessels and or new vessels may re-appear in the future. Factor 50 sunscreen daily is recommended along with topical vitamin C and m maintenance laser sessions may be required. Usually most patients do 3-6 sessions to begin with. A full face laser session is €100. A patch test is done prior to commencing any treatment. The cost for this and the initial Dermatology consultation is €100. Pigmentation will look darker for up to 7 days on the face and the face can look a little red for a few days post treatment for facial redness. There is no actual downtime though. Make up can be applied immediately and return to work immediately is also possible.